Today's been a great day. Although Trev has a cold, he's still feeling well, so we're not contending with anyone extraordinarily grumpy or out of sorts. 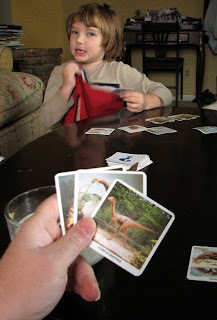 This morning/early afternoon we played a couple hands of go fish. We gathered up pears today, as it's supposed to freeze tomorrow - though we forgot about the tomoatoes! 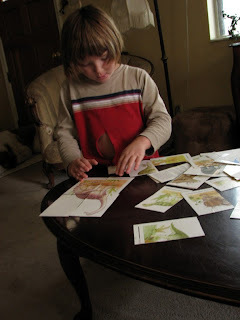 Trev played with the dinosaur cards our friend Melissia gave him. 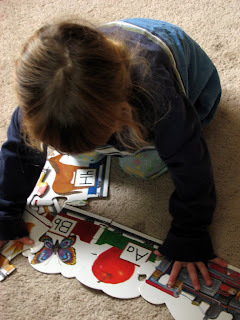 Maddie lugged up the train puzzle from downstairs, and had a go at it. 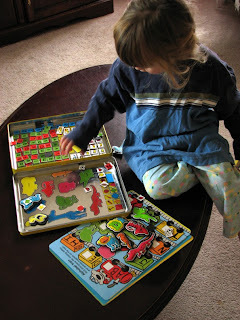 I found these magnetic things that haven't been out for a while, so I showed Cakes, and she loved it. Trev's been playing Math 1-2, as I mentioned, and today while I was cleaning out the cupboard in our livingroom with our various books and things in it, I was going to take the (math 1-2)workbook downstairs, but Trev stopped me, saying "I want this up here!" "All right, we'll put it back in the cupboard." We eventually (around 2:30) decided to get out to lunch and the grocery store - we were in desperate need of a trip to the natural market. Ever since we've discovered a suspicious closet - that's always locked - Wild Oats (Waldo's) has become much more fun for Trevelyn (they don't carry Skittles, you know). That, and the little kid carts, of course. We have discovered that the closet houses a ghost - we have named him Waldo, naturally. Somewhere before lunch and the market - maybe it was while we were getting Trev some new tennies, Trev mentioned that Abraham Lincoln was on the penny. "Oh, I got it from Camp Lazlo and Fosters Home for Imaginary Friends. What can you tell me about Abraham Lincoln?" So I did my best, which wasn't much. "Shall we go get a book at Barnes and Noble about Mr. Lincoln after lunch?" We discussed him quite a bit more, and the civil war, and eventually somehow - halloween, I guess, the topic turned to the Satans, as Trev calls it/them. Not Devils, but Satans. Gave him my take on that (which he already knows) and we discussed what some folks believe about hell, and guessed why he's always red, or mostly (fire reflection?) and even that some folks think he's really handsome to disguise himself. Off we went to the bookstore, where Maddie tore reader after reader off the round spinny-shelve thingies while I was looking for a decent Abe Lincoln or really good American History book. I have so few history books - One on Martin Luther King, and one on Mark Twain, but sadly, I think that's about it. Eric knows tons about mountain men and trappers, and Lewis and Clark, so we're covered with that. But if anyone has any super terrific history books, please pass on your information! We also picked up our first Ranger Rick magazine. While in Harmons and Waldo's we also discussed iguana's, and how I believe that they are the only lizard that make a noise. Course, now we gotta find out what that noise is, exactly, and if I am right, and it is the iguana. And read the RR magazine. And the other Scooby-Doo book that we purchased. And Trev wants to make the Haunted House gingerbread house that we bought (a kit), but I told him we don't have the time or energy tonight, and that we'll do it soon. I'm very excited about that one, too. It's been a very full, fun day, and I am almost out of time before I am due for more stories.